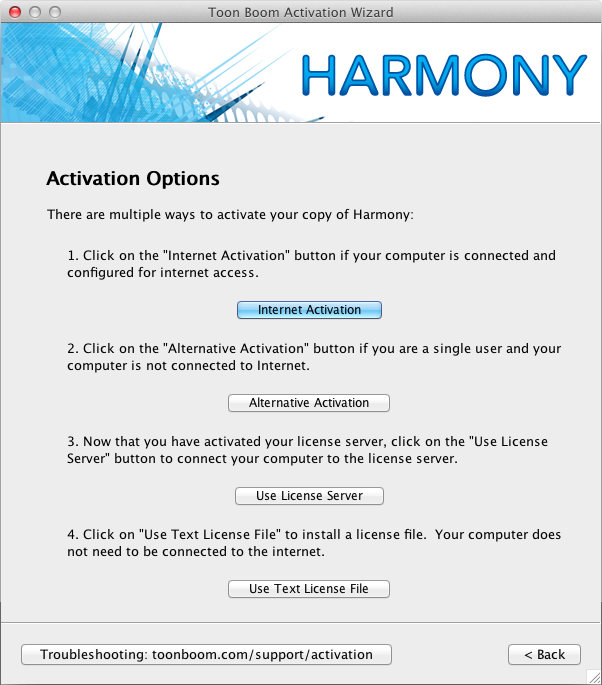 After installing Harmony, you must configure the database parameters and the third party software based on the role this computer will have. 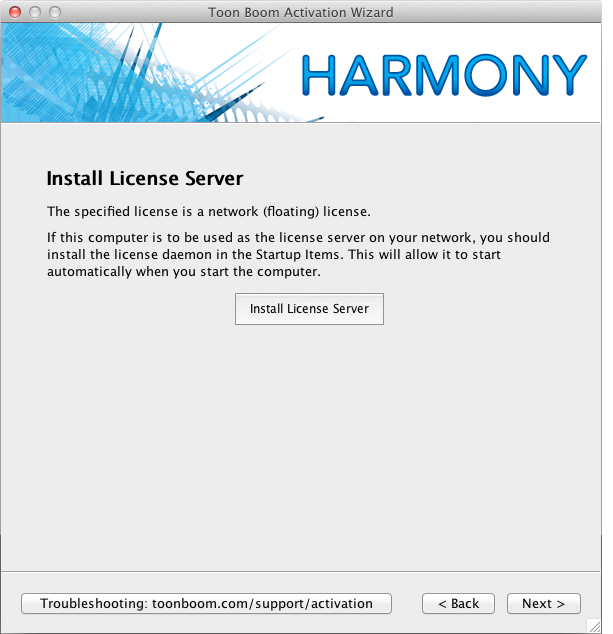 Once Harmony is installed, additional steps are required to configure the database on the server and to setup the Startup Items and register the application path for the Terminal. 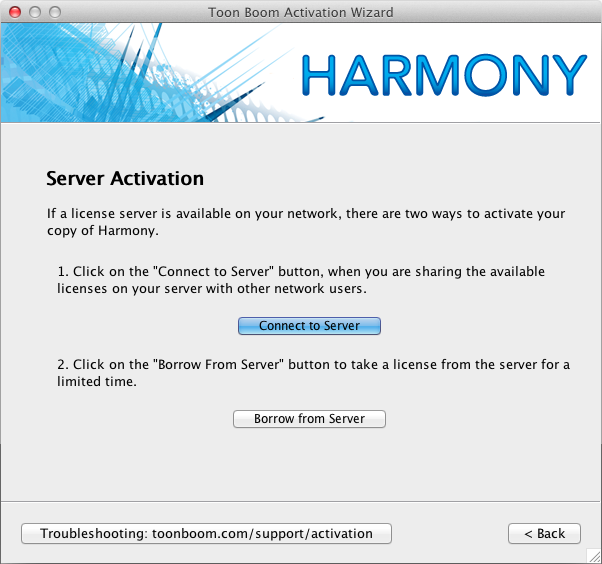 The database server controls all interactions with the contents of the Toon Boom Harmony 10.3 database. It processes all requests to open, read or update files, keeping track of files that are locked so that others cannot edit them. 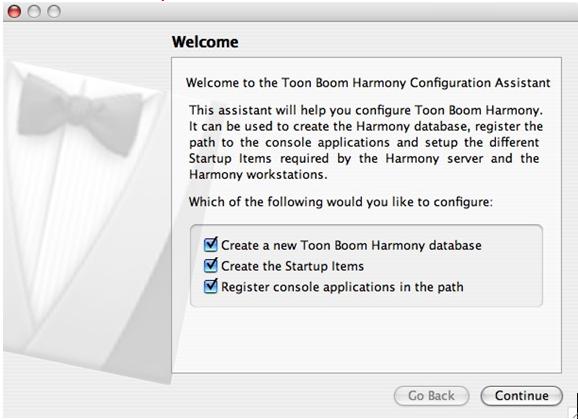 If you already have a database set up from a previous installation of Toon Boom Harmony 10.3 you DO NOT need to set up the database server, startup items, or register console application in the path. However, if you are upgrading from a previous version, you need to install the startup items and register console applications in the path. 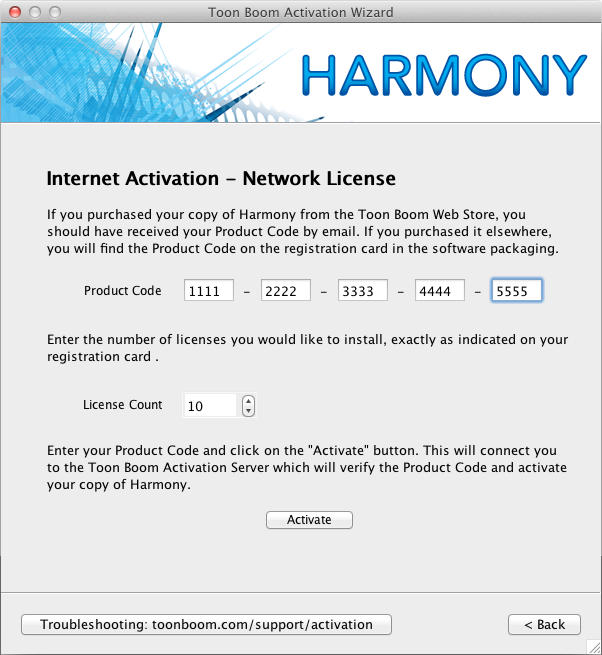 For new installations of Harmony, you must install all of them. 1. 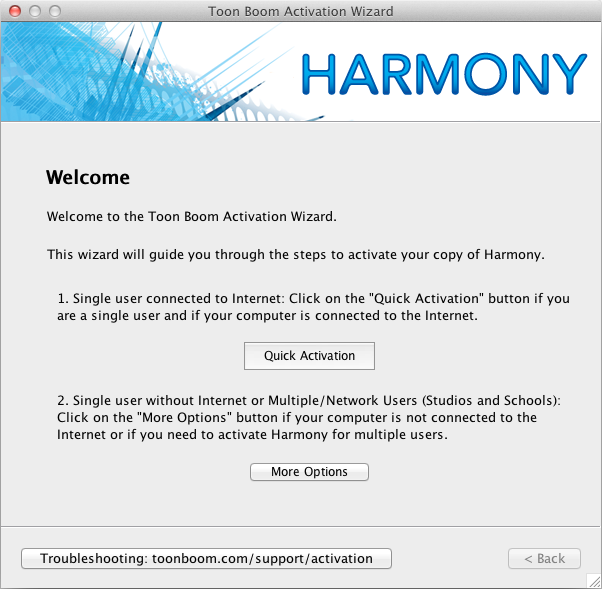 From Finder, go to Applications > Toon Boom Harmony 10.3 > Tools. 3. For the server, select all three options if this is the first time you are installing on this machine. 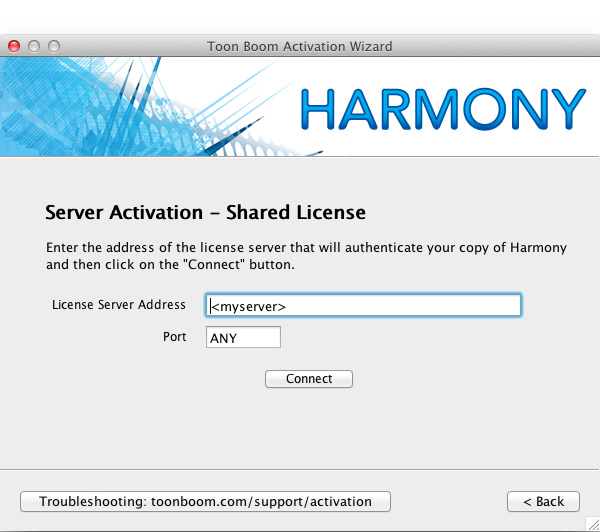 ‣ If you are upgrading from a previous version and a database (/USA_DB) already exists on the server, unselect the Create a new Toon Boom Harmony database option. ‣ If you are upgrading from an earlier version of Toon Boom Harmony , you will need to update the dict files in the USA_DB. The dict files need to be copied from /Applications/Toon Boom Harmony 10/tba/etc/USADB_templates/dicts/ to /USA_DB/dicts/. 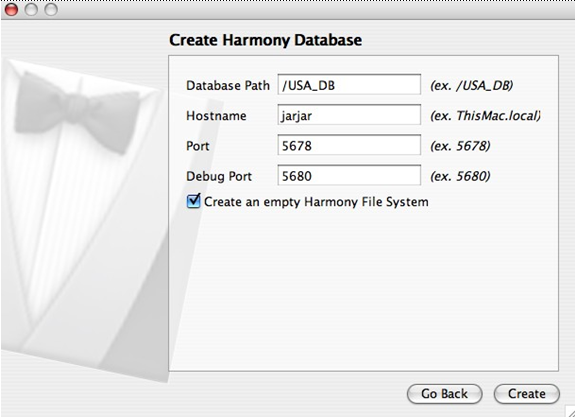 The Create Harmony Database dialog box opens. The default values shown in this dialog box should be correct and therefore accepted as is. 5. Click on the Create button in the Create Harmony Database dialog box. Note that you need to be logged in using the root account to be able to do this. If you are not logged in as the root user, you will need to type sudo before launching the command. If you want to use a name other than usadataXXX for the Toon Boom Harmony 10.3 File System, you will need to edit the Manager.conf file and add the name or search pattern for this new file system. The Manager.conf file can be edited using the Configuration Editor that is found in the Tools folder of your Toon Boom Harmony 10.3 installation. Open the Configuration Editor and select the Manager.conf tab. 6. In the Create Startup Item page, select the Startup Items required. 7. Click Create to continue. ‣ Create Database Server Startup Item: It is mandatory to install the Database Server Startup Item on the server. 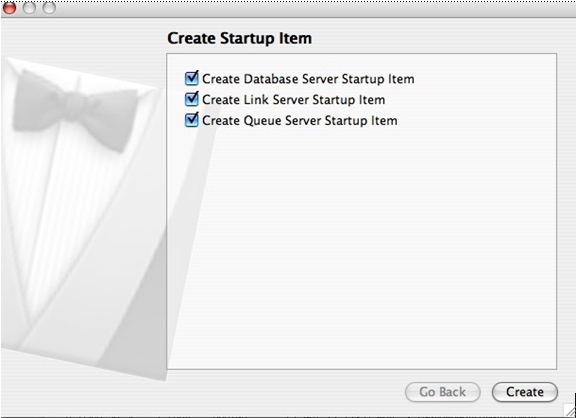 ‣ Create Link Server Startup Item: This Startup Item is required when there will be Windows clients connecting to the Mac server. This service creates symbolic links when a scene is created from a Windows client workstation. ‣ Create Queue Server Startup Item: This is for the batch rendering. Do not install this on the server, as it will slow it down. Install this on a stand-alone machine that will be used for batch vectorizing or rendering. 8. 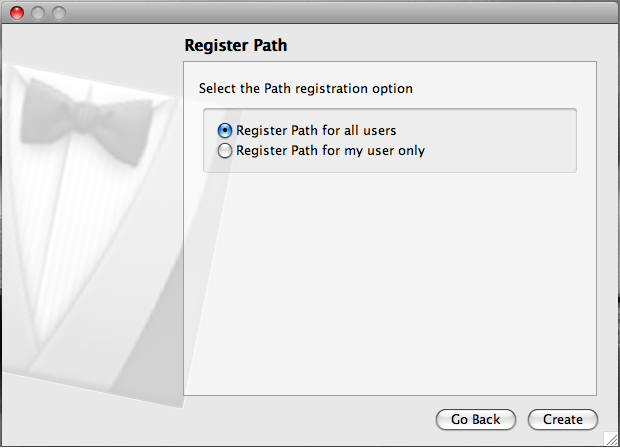 In the Register Path page, choose whether you want to register the path for the current user or for all users. 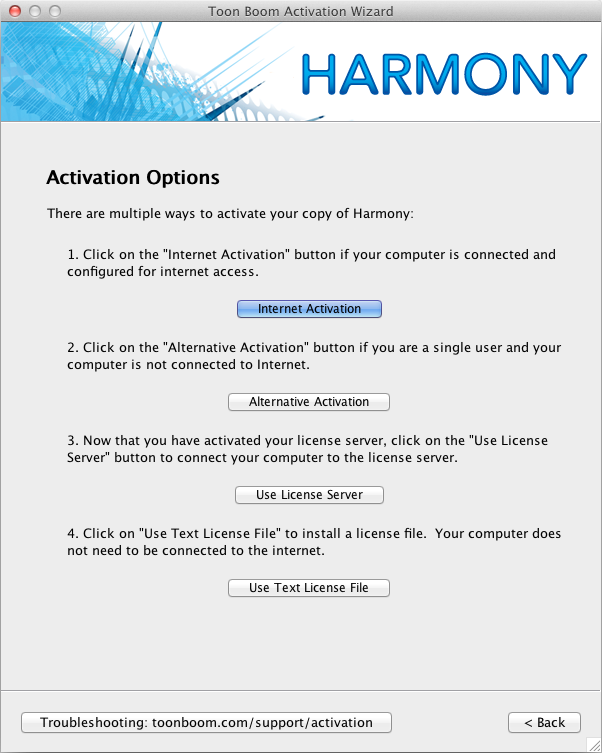 This option appends the path of Harmony's applications to the PATH environment variable in order to run the applications from the Terminal. ‣ Registration Path for all users: registers the path for all accounts on the computer. You only need to run this once. ‣ Registration Path for my user only: This option registers the path to the current account only. You need to run this for each user that will be using the Terminal and you need to run this each time you create a new user. 9. Click Create to go to the next page. 10. Click Done to close the Configuration Assistant. 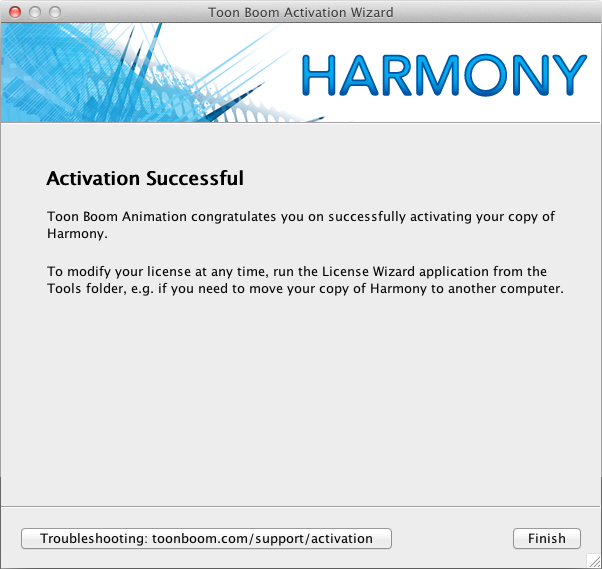 The licensing must be configured before running Toon Boom Harmony 10.3. 1. 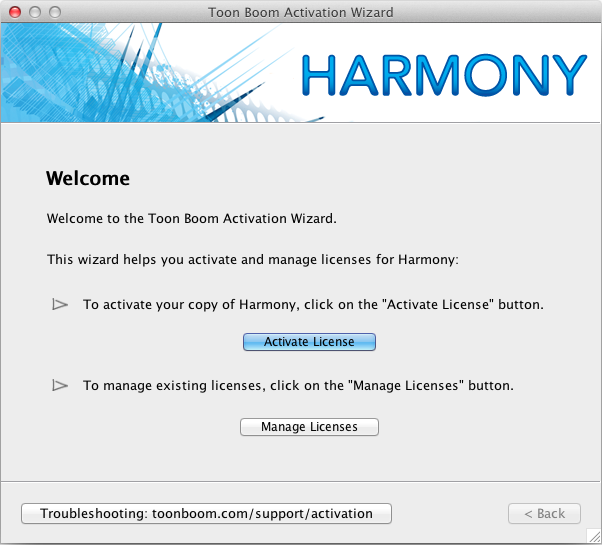 Launch the License Wizard from Applications > Toon Boom Harmony 10.3 > Tools > LicenseWizard. ‣ If this screen appears: Click on More Options. ‣ If this screen appears: Click on Activate License. 5. Type or copy/paste the Product Code and type in the number of licenses (License Count) this product code grants you. Once activated and returned to the activation server, a server license cannot be activated again. Make sure you are activating the license on the correct computer with the proper license count. This step will create the license.dat file and place it in /usr/local/flexlm/licenses/license.dat. It will also configure and start the License Server service. 1. Open the License Wizard on the Client machine. 3. Click on Use License Server. 4. Click on Connect to Server. 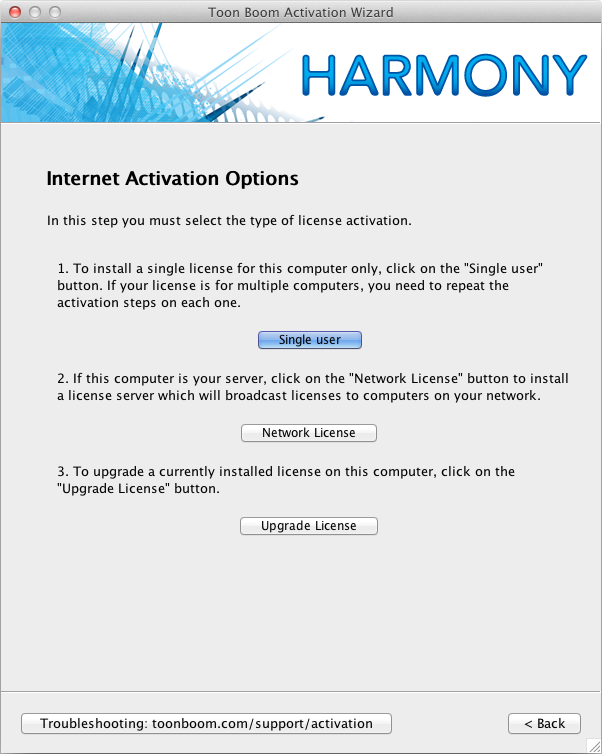 The Server Activation - Shared License dialog appears. 5. Enter the hostname or the IP Address in the License Server address field. 6. Click Connect. You will be prompted for a password. 7. Enter the password and click OK.
8. The Activation Successful screen appears.